Trepp released its June 2016 CMBS Delinquency Report today, highlighting the third straight monthly increase for the delinquency rate. In June, we saw the first evidence of loans failing to obtain refinancing weigh on the delinquency rate. Trepp, LLC, the leading provider of information, analytics, and technology to the CMBS, commercial real estate, and banking markets, released its June 2016 US CMBS Delinquency Report today. The report can be found here: http://info.trepp.com/june-2016-us-cmbs-delinquency-report-pressrelease. The Trepp CMBS Delinquency Rate moved noticeably higher in June, as the rate was pushed up by loans that reached their maturity date but were not paid off. The delinquency rate for US commercial real estate loans in CMBS is now 4.60%. The rate has increased 25 basis points from May, but is 85 basis points lower than the year-ago level. In June, CMBS loans that were previously delinquent but paid off with a loss or at par totaled almost $900 million. Over $500 million in loans were cured last month, and over $2 billion in loans became newly delinquent. However, over $13 billion in loans were paid off in June, which gave the remaining delinquent loans an increased weight. The percentage of seriously delinquent loans, defined as 60+ days delinquent, in foreclosure, REO, or non-performing balloons, increased along with the overall delinquency rate. The rate of seriously delinquent loans inched up 24 basis points for the month, now 4.48%. 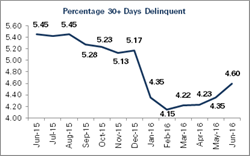 If defeased loans were removed from Trepp’s delinquency calculation, the 30-day delinquency rate would be 4.83%. By property type, delinquency rates for all but one of the five major sectors increased in June. The multifamily delinquency rate fell one basis point to 2.35%, so apartment loans remain the best performing major property type. The retail sector underwent the largest increase out of all major property types, as that delinquency rate moved up 36 basis points to 5.72%. For additional details, such as delinquency status and historical comparisons, download the June 2016 US CMBS Delinquency Report http://info.trepp.com/june-2016-us-cmbs-delinquency-report-pressrelease. For daily CMBS commentary, follow @TreppWire on Twitter.